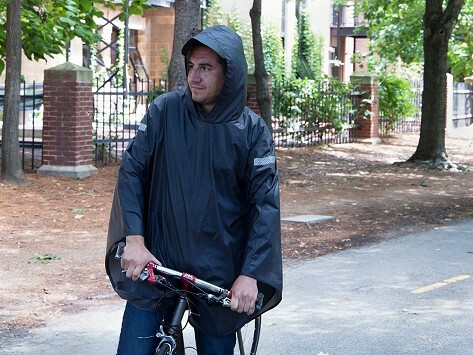 This Made in the USA rain cape features reflective details, a brimmed hood, and thumb loops for dry hiking, biking, or walking. Dimensions: Front (shoulder to hem): 36.5"; Back (shoulder to hem): 37.5"; Width: 51.5"
This is a fairly sturdy garment but it has some drawbacks. • The hood is too large and covers the face (and I'm a big guy) • The materialThe material is not as substantial as I thought it would be. It is quite thin. The carrier bag has more substance than the product. Maybe that ought to be switched (a heavier garment and lighter carrier). • I do not see the value for the price. I kept the garment as I needed to use it the day after it arrived. As I shopped other suppliers, I saw other similar products for much less. • The thumb loops are the best feature. I used this with handlebars.